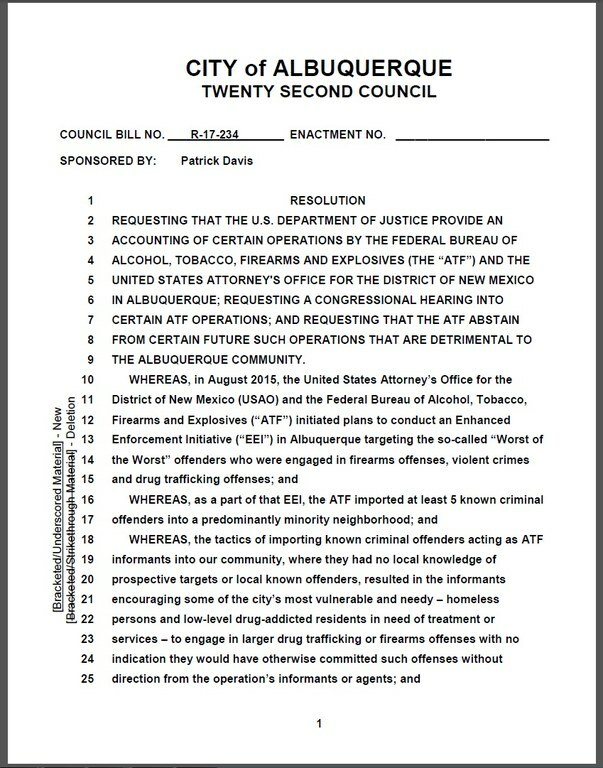 Albuquerque City Councilor Pat Davis has introduced a resolution requesting the New Mexico Congressional Delegation support public Congressional hearings into an operation of the Federal Bureau of Alcohol, Tobacco, Firearms & Explosives (“ATF”) and the United States Attorney's Office (USAO) for the District of New Mexico that disproportionately targeted minorities, eroded trust between law enforcement and the community, and brought more crime to Albuquerque. 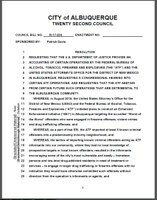 The resolution, R-17-234, will be formally introduced at the Albuquerque City Council meeting on Wednesday September 6, 2017. Davis says he intends to request the Council hold a public hearing to allow families of those targeted to tell their story and to clarify involvement of APD in this federal operation. The resolution is available in its entirety here. Supervisors overseeing the program failed to prevent biased targeting of African-American and Hispanic residents, and failed to follow up on firearms offenses against a white offender. Informants and agents encouraged homeless and drug-addicted residents of Albuquerque to engage in larger drug trafficking or firearms offenses with no indication that they would have otherwise committed such offenses without direction from the operations informants or agents. Informants engaged in crimes outside of the scope of this investigation, creating more crime in our city and in surrounding communities; in some cases while using vehicles and funds provided by the federal government. The program, designed to target gun offenders, resulted in the arrest or indictment of 102 persons but less than 1/3 of offenders were involved with a firearms offense. The operation has eroded trust between law enforcement and the community in a city working under a US Department of Justice Consent Decree to rebuild those relationships. Our city has seen any measurable decrease in gun-related offenses since this operation concluded. The ATF team conducting this operation has been criticized in other cities for targeting minority offenders and failing to implement policies to prevent biased targeted. The team relied on the tactic of importing known criminal offenders acting as ATF informants into our community, where they had no local knowledge of prospective targets or local known offenders, which resulted in the informants encouraging some of the city’s most vulnerable and needy – homeless persons and low-level drug-addicted residents in need of treatment or services – to engage in larger drug trafficking or firearms offenses with no indication they would have otherwise committed such offenses without direction from the operation’s informants or agents. The Enhanced Enforcement Initiative (“EEI”) appears to have specifically targeted only minorities in Albuquerque because while Albuquerque’s population is 3 percent African-American, 48 percent Hispanic, and 40 percent non-Hispanic white residents, the operation imported only African-American and Hispanic informants and deployed them in a minority-majority impoverished neighborhood. An agent also testified in federal court that they did not attempt to identify a white target who provided a firearm to an African-American target who was later arrested and charged. Senior U.S. District Judge James Parker found that the tactics deployed by the ATF in Albuquerque “made it likely they would arrest a disproportionate number of minorities”. The New Mexico In Depth news site has led reporting on this operation. Their coverage can be found here.